The 81 titles listed below are the only stories in the Casefiles series that were printed and published in the UK (although the scheduled release of #125 Stress Point was cancelled prior to its publication). This selection consists of a contiguous range of novels from #1 Dead on Target through to #71 Real Horror, plus ten novels seemingly picked at random from the remaining portion of the series. Some of these titles were issued in more than one format; as a result, the following pages contain approximately 100 different variants, plus 18 omnibus editions (which are also listed in the dedicated Omnibus Editions Gallery section). The title that has the distinction of having appeared in the most number of formats is #12 Perfect Getaway – the only Casefile that was released by all three main imprints: Armada, Archway and Pocket Books. The 46 novels that were not issued by a British publisher were, however, made available to consumers in the UK, Australia and New Zealand in the form of imported US Archway paperbacks. 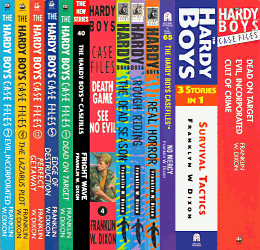 Although these paperbacks were recorded by the British National Bibliography, they are not included here (the Imported Editions Appendix page does contain a partial list of Casefile imports). To get the full scoop on the British editions of this popular spin-off series, please visit the Casefiles History page.